There are several supplements that purport to block the production of estrogen in your body. The U.S. Food and Drug Administration, however, does not regulate claims made by supplement manufacturers. Therefore, scientific evidence does not necessarily verify the purported benefits of supplements that claim to block estrogen in your body. The excessive production of estrogen in men and the decrease of production in women can have serious health consequences. Thus, you should speak with a medical professional prior to taking any supplement that purports to change estrogen levels in your body. Estrogen is a hormone responsible for several functions in your body the development of sexual organs, maintenance of pregnancy and growth and development of the female body. Although commonly associated as a female hormone, men also produce a limited amount of estrogen. According to "Harrison's Principles of Internal Medicine," approximately 1 to 8 percent of the testosterone produced by men converts to estrogen. This conversion can have unwanted physical manifestations in some men. Aromatase is an enzyme that converts testosterone to estrogen. The supplements that block estrogen do not block estrogen production directly. Instead, these supplements block the aromatase enzyme. This action also boosts the production of testosterone naturally without the use of steroids. Novadex XT and 6-OXO are estrogen blockers that function by blocking the aromatase enzyme. Anti-aromatase or estrogen-blocking supplements contain a variety of ingredients. The specific ingredients will vary based on the manufacturer's specific formulation. However, these supplements typically contain diindolymethane, 7-dihydroxyflavone, LPC and chrysin. Additionally, these supplements contain herbs associated with the increase in testosterone production. Herbs commonly found in estrogen-blocking supplements include fenugreek, fadogia aggrestis, epimedium sagittatum, tribulus terrestris, shilajit moomiyo and dodder seed. Men typically use estrogen blockers to increase testosterone levels in their body. Having too much estrogen can cause water retention, feminization and muscle loss in men. Additionally, according to "Guyton and Hall Textbook of Medical Physiiology," excess estrogen levels in men can cause gynecomastia, or breast enlargement, slow progression of male pattern baldness, acne and possible prostate enlargements. On the other hand, the increase of testosterone production can also cause health problems including an increase in dihydrotestosterone. 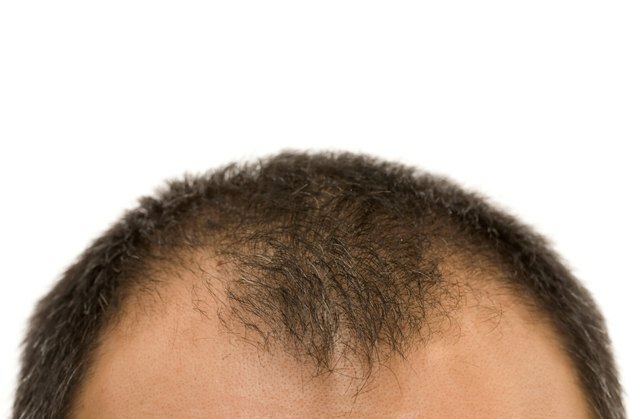 Elevated levels of DHT can lead to prostate cancer, acne and male pattern baldness.